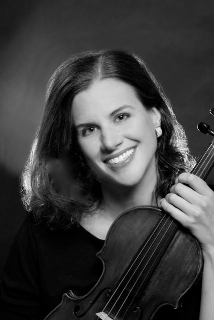 Maria Schleuning has been violinist for the Dallas-based contemporary music ensemble Voices of Change since 1996, and was appointed Artistic Director in 2009. An advocate of new music, she has worked with many of the leading composers of our day, and has premiered many new works, the most recent being "Dream Catcher," a solo violin work written especially for her as a gift by Augusta Read Thomas. The world premiere performance was on May 3, 2009 in Dallas, TX. An active chamber musician, Ms. Schleuning has performed in venues such as New York's Alice Tully Hall, Weill Hall, Merkin Hall, and the Museum of Modern Art, as well as numerous festivals throughout the United States and Europe. Since 1993 she has been a faculty member at the Bowdoin International Music Festival in Maine, and has served in the same capacity at Idyllwild Arts in California since 2007. She has recorded with Continuum in New York, as well as in Dallas with the grammy-nominated Voices of Change, and the Walden Piano Quartet. A member of the Dallas Symphony since 1994, she has been featured as soloist with the orchestra on many occasions. Other solo highlights include appearances with the Oregon Symphony, Seattle Symphony, and with the Greater Dallas Youth Orchestra on a tour of Eastern Europe including concerts at the Gewandhaus in Leipzig and the Rudolfinum in Prague. She studied with Josef Gingold at Indiana University, where she was awarded the prestigious Performer's Certificate; with Yfrah Neaman at the Guildhall School in London, with a grant from the Myra Hess Foundation; and with Joel Smirnoff at the Juilliard School, where she received her Master's Degree.